A recent article from Project CBD highlighted a concern about the effects of propylene glycol in your vape pen. In case you aren’t aware, Project CBD is an educational resource for cannabidiol and cannabis topics. Project CBD regularly shares the latest in cannabis research and knowledge of the endocannabinoid system. Research on cannabis, CBD, and the endocannabinoid system is really only just getting started, and what Project CBD aims to do is bring that information to the public. As you may not be surprised to know, in the article, it was revealed that several popular CBD vapor products use PG. This does not come as shock because most eliquid products and nicotine vapor liquids use PG. It is common to see PG/VG ratios as high as 75% PG, to add the “throat hit” effect for new vapers just making the switch to full time vaping. Unless you take special care to avoid propylene glycol, you are likely to find it in vapor and eliquid products. PG stands for Propylene Glycol. It is a chemical additive that is categorized as GRAS (Generally Recognized As Safe) for both ingestion and topical use by the FDA, but has not been studied for inhalation use. Propylene Glycol is present in many common household products, from makeup, cleansers, gels, toothpastes, pet foods, etc. There is no conclusive evidence that PG is harmful, but there have not been any long term studies on the effects of inhaling PG. PG is a thinning agent, and a carrier liquid. PG can help improve and bring out flavors in eliquids and allow for faster wicking in the electronic cigarette. As mentioned before, PG also gives some of the same “throat hit” feeling as smoking combustible cigarettes, which can be an aid to new vapers just getting away from smoking. There are definite cons to using PG in your vape, however, causing vapers to weigh their options. Some vapers have reported “PG allergy”, in which they experience sinus inflammation after using PG. These claims are supported by a study, published in 2010 by the International Journal of Environmental Research and Public Health, that found that airborne PG can exacerbate many allergic symptoms such as asthma and eczema. Another study published by the New England Journal of Medicine showed that when e liquids containing PG were heated over 5V, there were higher levels of carbonyls such as formaldehyde in the ecig vapor. Formaldehyde is toxic, and is not safe to breathe. 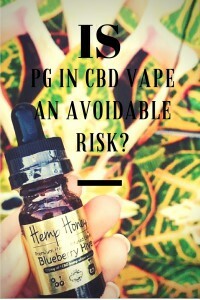 The jury is still out as to whether vaping PG is harmful or not, but since some early studies point to potential negative effects of vaping PG, you may be wondering if propylene glycol is an avoidable risk with your CBD vape. Hemp Honey Liquid is a 100% VG blend. Hemp Honey uses only all-natural ingredients and excludes additives such as propylene glycol. If you choose to vape Hemp Honey, you will not need to worry about the effects of vaping PG. You can relax knowing that Hemp Honey contains only CBD Rich Hemp Oil, Pure USP Grade Vegetable Glycerin, and Natural and Organic Flavorings.